Read Part I, covering Stepan Bandera’s early life and the birth of the Organisation of Ukrainian Nationalists. Read Part II, covering collaboration with the Nazis and the role of the Ukrainian Insurgent Army in the Holocaust. Soviet defence at Stalingrad had finally halted the seemingly unstoppable Axis war machine in February 1943 and from hereon the initiative seemed to be with the Red Army. Trapped between the devil and the deep blue sea, the UON-B resolved to fight a war on two fronts. In their minds, the Soviet Union remained the ultimate enemy, but their inability to challenge the Nazis – and their early enthusiastic collaboration – had cost them dearly in the war for hearts and minds. Their theory was that Soviet victory would annihilate Nazi Germany, but leave the USSR too thinly stretched to control Ukraine and make the country ripe for nationalist insurrection. Many UPA commanders – some little more than regional warlords – had been sparring with the occupiers on an ad hoc basis, but now they attacked in earnest, carving out chunks of territory. There was another force that the UON-B had no wish to share their Ukraine with too, in many ways the original enemy of their aspirations: Poland. Thanks to the UON’s collaboration with the Nazis earlier in the conflict, any reproach with the Polish Home Army (the resistance organisation loyal to the Polish government-in-exile in London) was impossible. 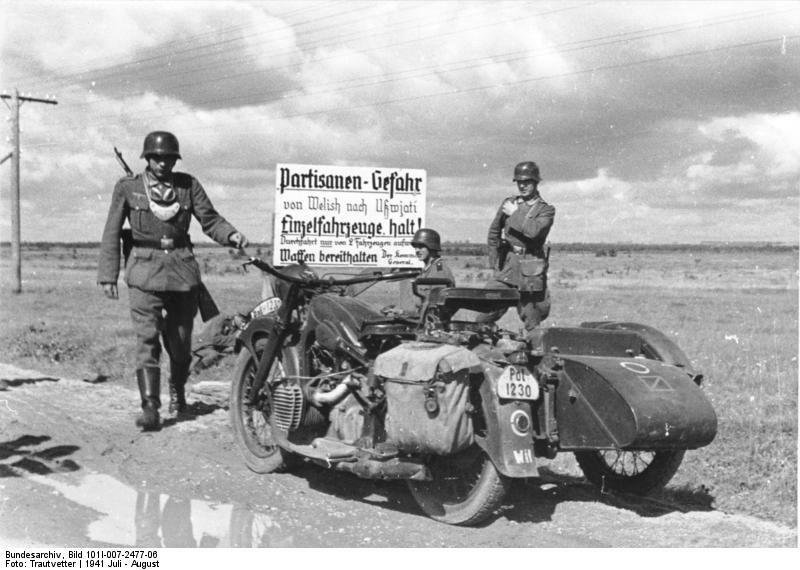 What’s more, the Home Army’s stated aims were to restore Poland’s pre-war borders, wiping away the Ukrainian territory bound together the unifying force of German occupation (although in actuality it was split into two administrative units). The UON realised that with the frontline swinging back their way and the end to the war coming sooner rather than later, the only way to undercut Polish claims to the region would be to remove the Polish population – already reduced to an estimated 200,000 by the hardship of war. The bloody prelude was the massacre of between 149 and 173 Poles in the village of Parośle by a UPA band posing as Soviet partisans. Then across March and April organised terror swept westward across the province of Volhynia, slaughtering an estimated 7,000 men, women and children in those two months alone. Homes were torched and helpless peasants run through with pitchforks and farm tools, filling history with accounts of bayoneted babies and mutilated bodies left hanging in warning. Ukrainians in mixed villages were coerced by the UPA with promises of confiscated farms to join the horror or flee, and at least 1,341 risked their lives – and at least 384 lost them – sheltering or warning their Polish friends. In mixed families the UPA’s order was unambiguous: kill the Polish spouse and any children resulting from the marriage. The density of the Polish population in Eastern Galicia offered up more coherent resistance – and ever counterattack. The Polish Home Army and other Polish resistance groups were active in the region, while many, more fearful of the UPA than the Red Army, were driven to join bands of Soviet partisans. Still, the slaughter continued, with the UPA pursuing their campaign of ethnic cleansing long after the Soviets had taken Ukraine and across 1943 to 1945 an estimated 35,000-60,000 Poles lost their lives in Volhynia and a further 25,000-40,000 Poles were killed in Eastern Galicia. His warning wasn’t only prescient, it was tragic and his wife was throttled by the attacking UPA who offered their more mild-mannered comrades the option of defection or death. Borovets, meanwhile, was captured by the Germans and sent to join Stepan Bandera in Sachsenhausen concentration camp. In January 1944, as the Red Army approached, the UPA ordered its forces to head underground and “save as much force as possible for our final and victorious battle against imperialistic Moscow.” The looming red menace brought halt to the skirmishes with the Germans and the UON-B resumed their collaboration, providing intelligence to the Germans in exchange for weapons and passed captured Soviet partisans and Wehrmacht deserters to the SS intelligence wing, the SD. Although so much horror had been conducted in Stepan Bandera’s name and to advance his ideology, the man himself had been under lock and key since those halcyon days of the German advance in Summer 1941. With almost all of Ukraine now swallowed up by the Soviet counter-offensive and total annihilation looming, the Germans began to give in to desperation. Bandera met with representatives of the SS’ Reich Main Security Office in April to explore the possibility of him conducting a guerilla war behind the enemy lines, before being released in September to set up a head office in Berlin, from where Bandera, Stesko and the rest of the previously incarcerated UON old guard conducted the torturous death rattle of the UPA war effort with air-drops of weapons and supplies to their men in the field. As the Red Army rolled into Kiev, the UPA avoided direct conflict – instead ambushing smaller groups of soldiers and NKVD, and undermining the re-establishment of the Soviet state by killing postmen and school teachers. Vast chunks of territory were carved out for the Ukrainian nationalists before the Soviets brought down the hammer in November 1944, burning the UPA out of their forests hideaways and setting up roadblocks in a vast effort that saw 20 NKVD combat divisions supported by artillery and armoured units deployed. In early 1945 the Soviets reported that 89,000 nationalists had been killed, approximately 91,000 captured, and approximately 39,000 surrendered. Fierce resistance continued until the late 1940s – long after the German surrender – but Soviet crackdowns, infiltration and mass deportations ground down the nationalist grip on the population to the degree that collective farms were introduced in 1947 virtually unopposed. By 1954, the war was over for the UPA and UON-B and on 15 October 1959, Stepan Bandera collapsed in the street, poisoned by KGB Bohdan Stashynsky with cyanide gas. His legacy, though, lives on in both the dark romance of the man prepared to fight all comers for a sovereign Ukraine and the toxic legacy of a far right firebrand whose underlings wet their hands in massacres, pogroms and political murder. For more stories from World War II, pick up the new issue of History of War or subscribe now and save 30% off the cover price.